– Two drinks can be placed in this cup holder ⇒ fig. 93. – Press the symbol A ⇒ fig. 94. 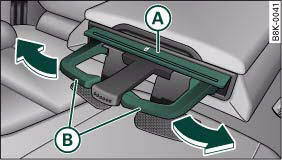 – To adjust the arm of the cup holder B, move it in the direction indicated by the arrow. 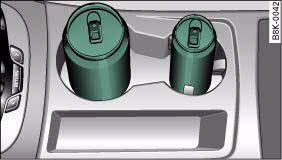 You should avoid putting open drinks containers in the cup holders. The drinks could otherwise spill over and cause damage to e.g. the electrical equipment or the seat covers.